Despite its mildly misleading moniker, the G45 is a 9mm pistol. It’s quite similar to the Glock 19X, but there are important distinctions beyond the black color. Have a look at the feature callouts in the images below for a fuller appreciation of these changes and improvements. I got to spend some quality time with the G45 this month and I have a few thoughts and some info to share. Why Consider the Glock 45? 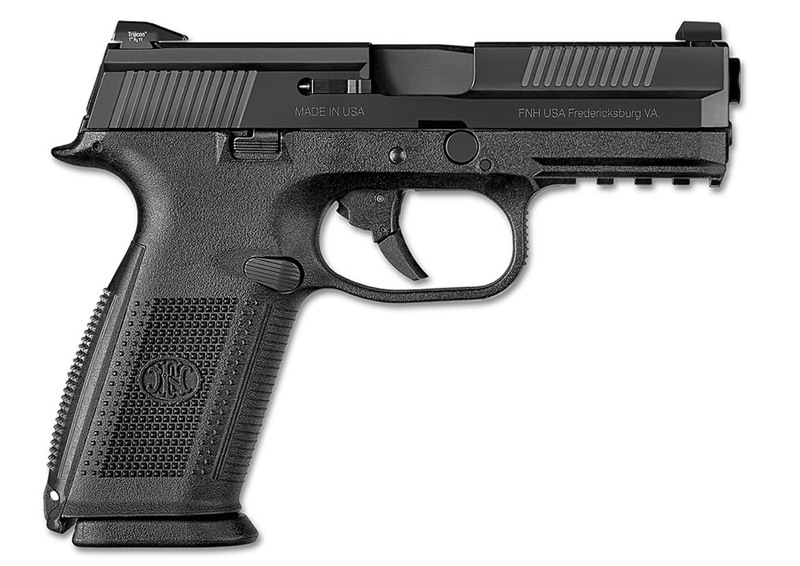 With its full-size frame and compact slide, the G45 is perhaps best considered as a duty pistol or home-defense gun. The shorter, lighter slide means less-pronounced muzzle-flip and its larger grip means more ammo capacity and slightly better control opportunities. The longer grip also means the Glock 45 is not the best concealed-carry gun. 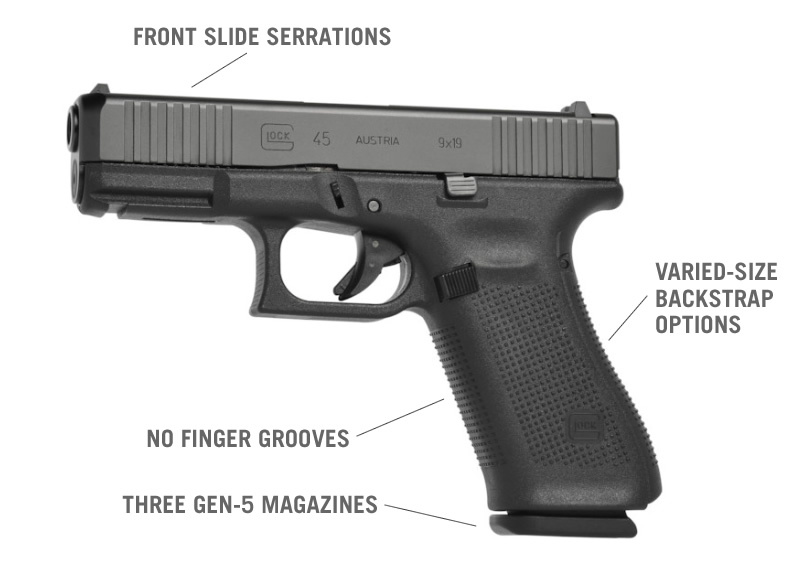 You might also consider the G45 because it represents a slight evolution in the current Gen 5 complement of features. Maybe call it a Gen 5.5 pistol. Many enthusiasts and law enforcement officerss may enjoy the slight enhancements featured on this gun. It’s a 9mm Glock pistol. I don’t believe it necessary to describe what it’s like to shoot one, except to say that performs just like any other mid-to-full-size Glock pistol. What is perhaps remarkable about the shooting experience is that the G45’s trigger is the best of the Gen 5 triggers I’ve ever pressed. It’s still a Glock trigger, but it’s considerably better than the Gen 4 trigger and to me it seems even better than the Gen 5 G19 triggers I’ve spent time with. 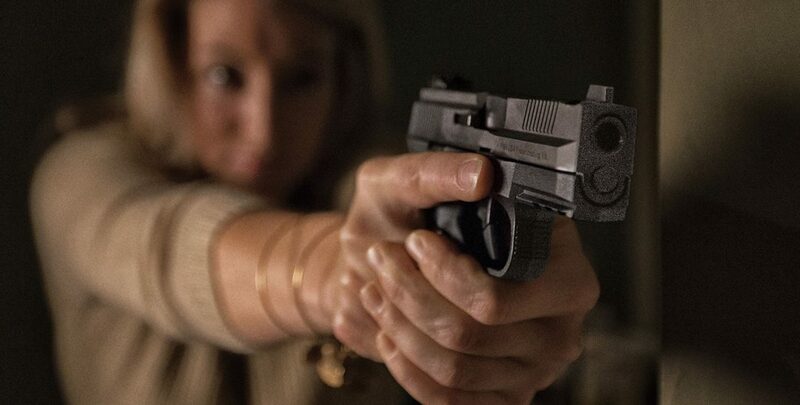 The pistol is eminently controllable and the extended grip (as compared to the G19) will make some people very happy; especially those with large hands. Glock pistols are never very ergonomic, but I’m quite used to them and find nothing exceptionable about this one. Again, it’s a Gen 5 Glock pistol, so… The G19-sized slide features the nDLC coating, which is a bit slicker than previous slide treatments, but the forward slide serrations will mitigate that slickness for some folks who care about such things. The sights are available in standard polymer “u-notch” sights, steel 3-dot sights, or factory Glock night sights. The slide has the contoured “bullnose” front area and the frame is contoured to match this feature. 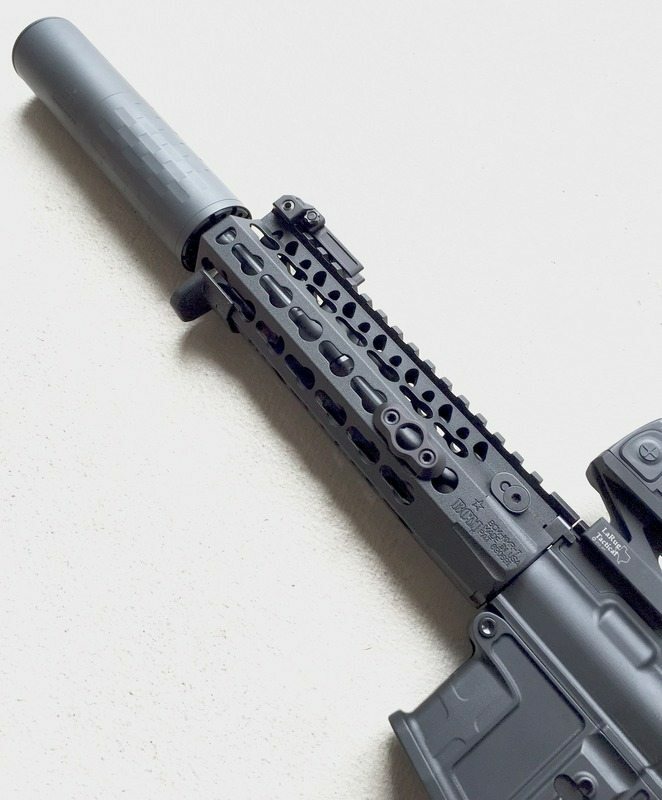 The barrel is the Gen 5 “Marksman” barrel, which is a genuine step up from the Gen 4 barrels. The slide stop controls are on both sides of the pistol and, as per usual, the magazine release control is reversible. The trigger has the smooth face rather than the G19-style serrated face. The full-sized grip has the flat frontstrap and, unlike other Gen 5 models, there is no cutout at the base of the grip. Like Gen 4 Glocks, the G45 comes with replaceable backstraps for sizing and comfort fit to your preference. 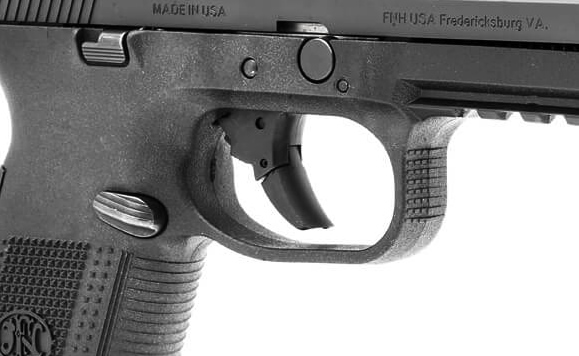 The base of the grip is mildly flared out to create a slight magwell (though it is not a true magwell and there is no need for one anyway). It’s a Glock, which means it’s the most reliable, safest pistol on the planet right out of the box. The full-size grip fits larger hands, allows for more ammo capacity, and better control. The G19 slide means lighter weight, less muzzle flip, and excellent balance to the whole gun. The new trigger is Glock’s best yet. The gun is not the best choice for concealed carry and the backstrap contour, as with all Glocks, is not the most ergonomic. It’ll likely be hard to find one with anything other than the typical polymer sights. I find it to be just fine, but I’ve learned to settle. Most quality pistols are far more ergonomic than any Glock pistol. It’s very shootable, especially with the better trigger. I found it to be plenty accurate and the Marksman barrel is a genuine boon to accuracy. It’s a Glock; the most reliable pistol on the planet. I have experienced no malfunctions of any kind while shooting the G45s. There are all kinds of aftermarket sights and other components for this pistol, and any holster that fits a Gen 5 Glock 19 will fit the G45. For duty carry or home defense, this is a gem of a pistol. I like how Glock is making small incremental improvements in their components and this pistol has the most and best options available. Rent the G45 at Eagle Gun Range, shoot a box or two of ammo through it, and see what you think! Responsible everyday carry means carrying all day, every day. Too many concealed carriers relegate their carry to those times when they’re leaving the house for some extended period of time. Such a failure of logic and responsibility declares that there are some times when it’s okay to be defenseless; when it would be okay for an armed assailant to take one’s life. A failure to carry while at home equates to the same declaration. I’ll argue that at-home carry is at least as important as away-from-home carry and is likely more important. Your home is your castle. 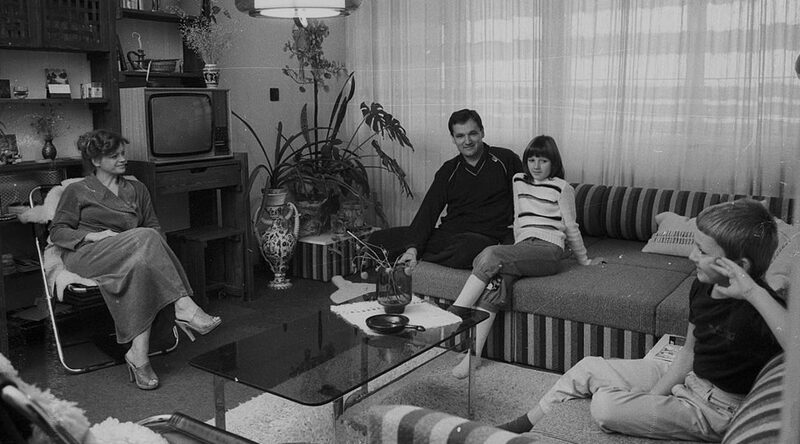 For many of us, our home is where our family is and where our family most needs protection. …or for any of the myriad things you do around the house that take you outside for just a moment. Staged firearms don’t help most particularly when you answer a knock at your door. Home-invasion robberies and assaults happen every day. Most begin so quickly and violently that victims do not have any opportunity to go and get a staged firearm for defense. Only one who is already responsibly armed has a chance to thwart a violent invasion of their home as it begins. That pistol under the coffee table or in the closet is unlikely to help you a bit when your door is kicked in by three armed thugs who swarm into your home and beat you senseless, or worse. Carry at home just like carry anywhere else involves, at minimum, a handgun and a tourniquet. Just as you don’t want to get caught needing a gun and not having one, you do not want to get caught needing a tourniquet and not having one. Either can save your life or the life of someone you love when seconds count. I have staged firearms in my home. They’re for specific scenarios that are beyond the scope of this article, but even so I carry every waking moment when I’m in my home. Unless I’m in bed or in the shower, I have my pistol with me at all times. It’s therefore with me when I check the mail, when I take the garbage to the curb, and when I do all the other things that are part of being at home during the day or evening. However, when I’m at home I want to be comfortable; more comfortable than when I’m out and about away from home during the day. If you’re like me, home time is when you throw off the discomfort and encumbrance of the day, to relax…or do housework, but in greater comfort. For responsible defensive carry, this might mean a different carry method or perhaps even a different gun for home carry than you use for away-from-home carry. 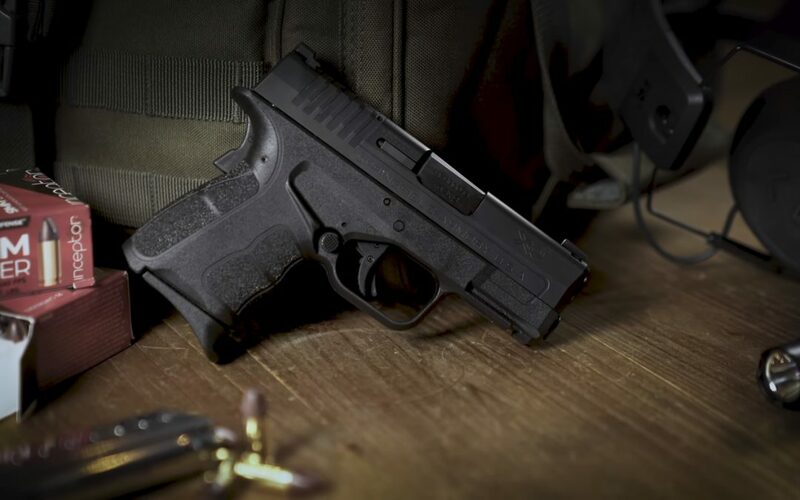 If you carry a full-size or compact pistol in appendix or at 4 o’clock position away from home, you might change to a subcompact pistol and/or pocket carry at home. I can say from experience that carrying a subcompact, single-stack pistol at home makes for a very nice change from the mid-sized double-stack pistol I carry away from home. It’s far less encumbering and allows for far greater comfort. 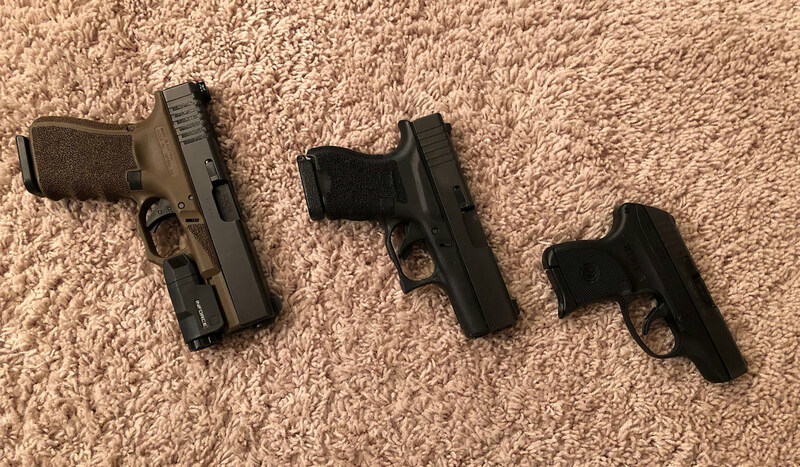 From Left to Right: My EDC Glock 19, my at-home-carry Glock 43, and my pocket Ruger LCP. The smaller pistols make for a nice transition at home to a less-encumbering option. I hated to give up wearing comfy sweatpants around the house when I started with defensive carry. I could still do it and carry a subcompact pistol with pocket carry at home, but I prefer to carry at home with the same method I carry away from home (appendix position); all the better for a panicked response. So I changed to wearing shorts at home. The compromise is that I have to wear a belt. It’s not my ideal for lounging around the house, but I’m prepared to make that small compromise. Since I’m not wearing a magazine pouch and phone on my belt at home, I can wear it a bit more loosely, allowing the slim, single-stack Glock 43 have little impact on comfort. 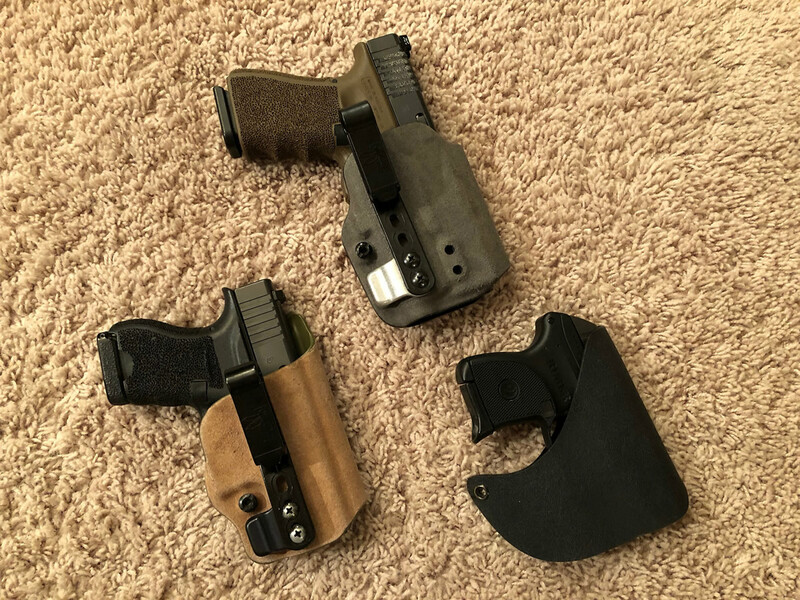 The same three pistols from the previous image, now holstered: the Glocks in AIWB holsters and the Ruger in a pocket holster. Part of what helps carrying a holstered pistol inside my waistband is the practice of wearing an undershirt. I never wore undershirts before I started carrying concealed. But I find that this small compromise makes for far greater comfort, even on hot days here in Texas when two layers might seem to be too much (it’s not). If you prefer comfy sweatpants or shorts and no belt at home, you might consider pocket carry at home. Remember, you still need a good pocket holster. So long as your gym shorts or sweatpants have a waistband tie string, something like a Ruger LCP in your pocket will ride just fine and encumber you very little. As for tourniquets, a RATS or CAT tourniquet fits easily in a pocket with little to no encumbrance or discomfort. You are no less vulnerable to assault, robbery, or ambush at home then elsewhere. What’s more, you likely have more to defend in and around your home than you do anywhere else. Responsibility requires that you be armed on your person and not simply have defensive arms or tourniquets “where you can get at them.” Save for a few rare anecdotes, such ideas are fantasy. Find what works for you. Decide what small compromise of comfort you can best make, but don’t make the irresponsible mistake of failing to be armed at home. Concealed carry is not merely an occasional choice, it is a lifestyle; a responsible lifestyle. 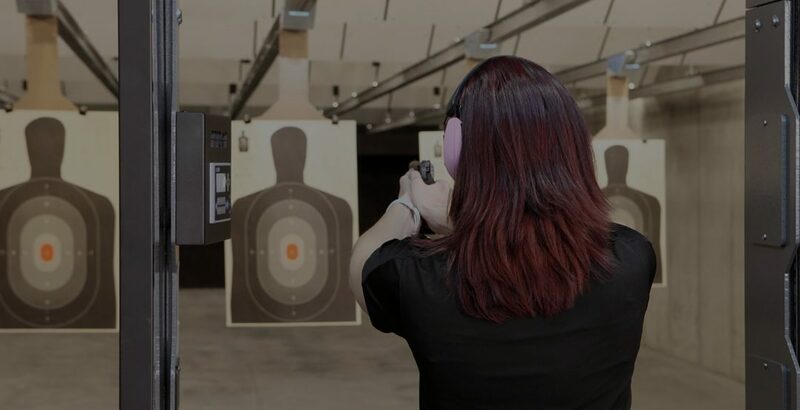 When you first start practicing with a handgun, the oft-heard instruction for defensive shooting is “aim center mass.” This is good advice for someone who knows nothing about armed defense and who will likely never seek training for and never practice for armed defense. Beyond this limited context, however, it is poor advice. The purpose of defending with a handgun is to stop the threat. This is specific: to end it—to make it cease to be a threat. In the case of human threats, this means to render the individual(s) incapable of continuing to be a threat. Context is everything, so “ending the threat” may be as simple as deploying your firearm in a compelling manner and issuing compelling verbal commands for the individual(s) to cease and desist. At the other end of the spectrum is the requirement for accurate shots on target to stop the threat. The specifics and totality of the context (and laws) may guide you in determining what level of force is appropriate, but it is the more violent end of the defensive spectrum that I want to deal with in this article. Specifically, we’re going to examine the few, small targets that when attacked with a handgun allow for a quick end to threats. Again, they are specific and few and almost never are they accounted for when aiming center mass. Above: Don’t use this target for your practice. Rather use one that does not focus on center mass, but instead has specific, effective target areas as outlined in this article – or – targets that are either simple outlines or are photorealistic and have no target areas defined (which makes for very good practice!). It is important to understand that the context for this article is for handguns only. Rifles and shotguns introduce different contexts and I’m not going to deal with them here. A handgun, generally, will put holes into people and animals. There are many handgun round calibers and slug types, but popular carry-handgun trauma characteristics are somewhat similar with regard to the specific and effective target areas of the human body. Rifle rounds, on the other hand, introduce far greater temporary-cavity trauma and generally put holes through people and animals. Shotguns, in addition to putting holes into people and animals have the added gruesome aspect of potentially taking chunks of anatomy off of the body, at close range. Suffice it to say that we’re only going to deal with the most likely form of defensive targeting, which is that with a handgun. If you put several rounds into an armed assailant’s center mass it may incapacitate or even kill him eventually, but real-life example after example demonstrates that he will likely suffer no diminishment or only mild diminishment of ability for minutes or even hours. In other words, you can shoot him in the belly and he can keep shooting at you or attacking you with a knife or with a crowbar for as long as it takes to kill you. “Center mass” will often do very little to stop the threat. In essence, you need to instantly turn the machine off. There are a couple of very good ways to do that; one is to traumatize the nervous system and the other is to traumatize the circulatory system. Again, neither of these is possible when you aim center mass with a handgun. 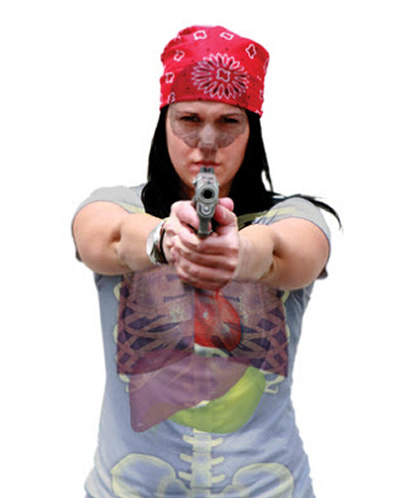 Attacking the circulatory system with a handgun in order to immediately stop a threat is not so easy as it might sound. True, any round you put into someone’s body will likely induce bleeding trauma, but most bleeding occurs too slowly to have any timely impact on the threat at hand. Effective attacks are possible at only a couple of small targets. Though you’re not trying to kill anyone, your defensive aim is to immediately incapacitate. Rather than traumatizing muscle, incapacitation is best achieved by causing a quick and dramatic loss of blood pressure. 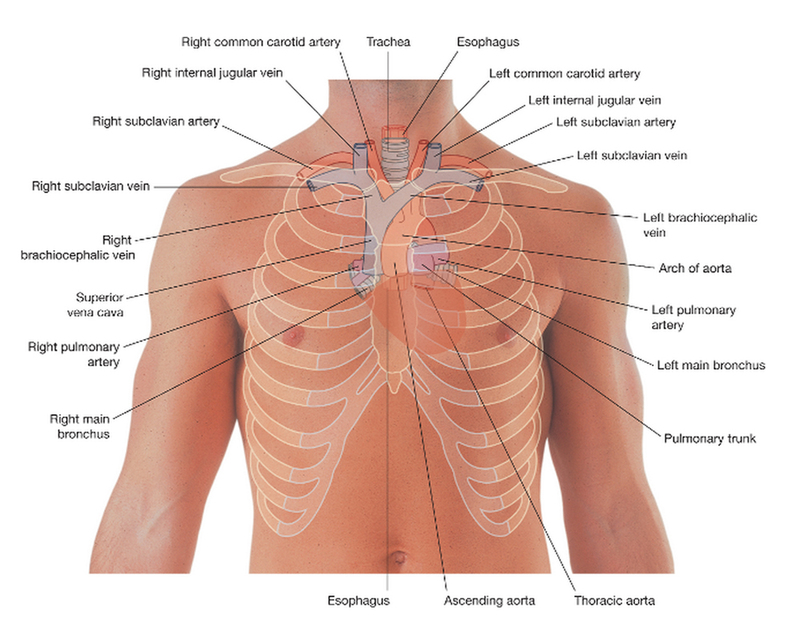 This means attacking the upper venous and arterial structure of the heart. 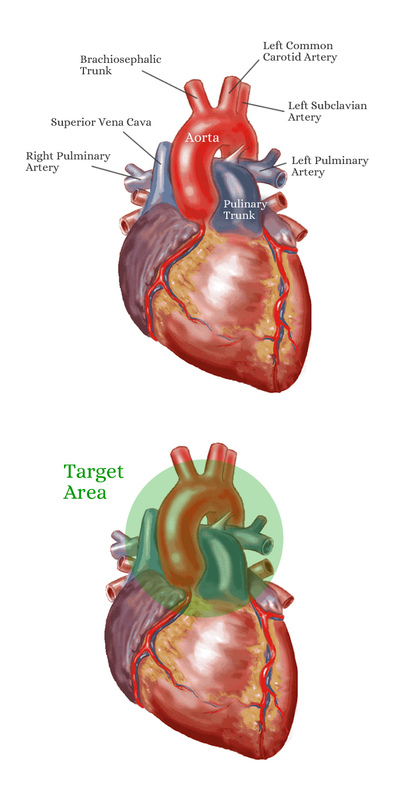 Trauma to this upper structure of the heart has the greatest chance of causing internal bleeding to the extent of causing a quick drop in blood pressure, greatly slowing down the assailant or causing loss of consciousness. 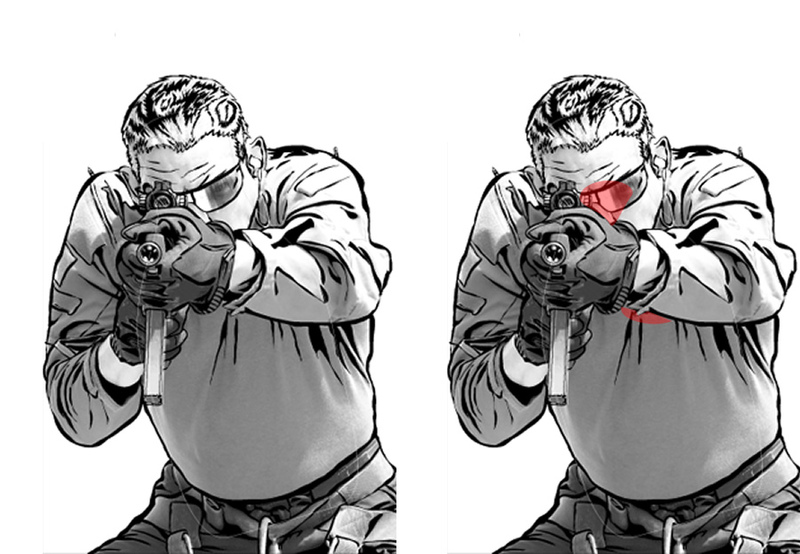 In your range training, do not aim for center mass and do not aim merely for the chest. Instead practice aiming and hitting this proper small target area exclusively. Regard anything else as a miss. Trauma to the central nervous system can essentially turn off the machine, causing a sudden loss of consciousness and a corresponding end to the threat. As defenders, this is what we want. As with the circulatory system, there are precious few targets for effective nervous-system attacks and none are large. On the front of the head, the best target area is between the pupils of the eyes and down to the bottom of the nasal area. The reason this is the best target on the front of the head is because the bone structure here is comparative thin and there are voids behind the frontal bone structure, allowing for easier access to the most effective target of the cranial area: the brain stem. On the side of the head, this same target is located at the top of the ear, where the skull is relatively flat, with the important target—the brain stem—just behind it. 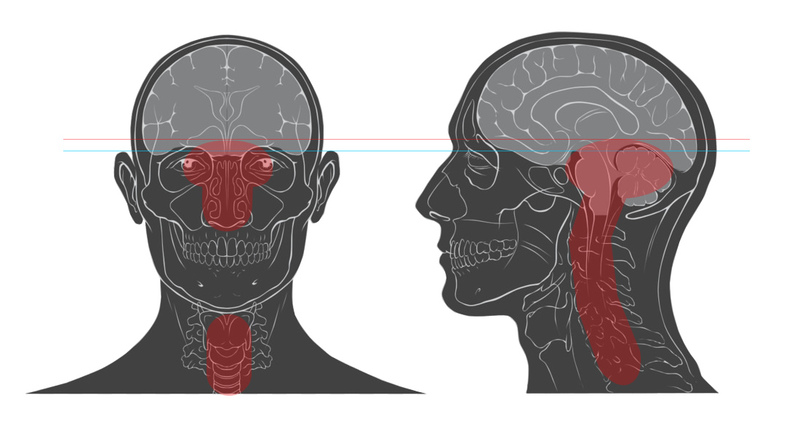 Note that other areas of the head are not good targets, as the human skull is designed to deflect energy away with its rounded structure. There are many examples of people being shot “in the head” where the bullet simply fails to penetrate the skull and either glances off or is caught under the skin where it travels around the skull rather than penetrating. It is true that the impact of a high-energy projectile to many places on the head can induce quite a shock to the system and even move the head so violently that one loses consciousness, but this is not a sure bet. As one defending his or her life, you want to cause an immediate end to the threat. You need surer targets. Given the specific scope of this article I’m not going to spend a lot of time here, but it is important for armed defenders to understand how various body angles change your target areas. 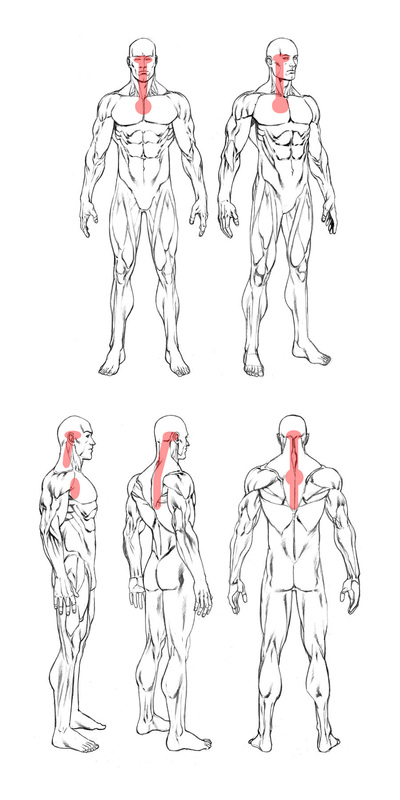 Targets on the front of the body are not necessarily the same as on the back of the body. They’re similar, but not identical. Learn them and adjust accordingly. For instance, it is difficult to attack the upper spine from the front with a handgun. Other than the neck, the spine is protected by various anatomical elements. On the back, however, the spine is somewhat exposed so the upper spine can be an effective rear target. Note, however, that it is highly unlikely that any assailant will simply be standing facing your or away from you, with arms at his or her sides. More likely they’ll be both at some sort of angle and their arms and or weapons will likely be in the way of certain important target areas. In addition to body angles, the fact that they’re attacking you or someone else means that they’ve got their arms and some sort of weapon in use, likely in front of their body. Additionally, their upper body is likely to be in a position other than simply ramrod straight and vertical. Notice how the assailants depicted on these training targets present far fewer effective target areas. If you’re going to carry a concealed handgun, don’t live and train with the illusion that simply putting holes in your attacker, even in center mass, will do anything to stop them attacking you before they’ve done great harm. 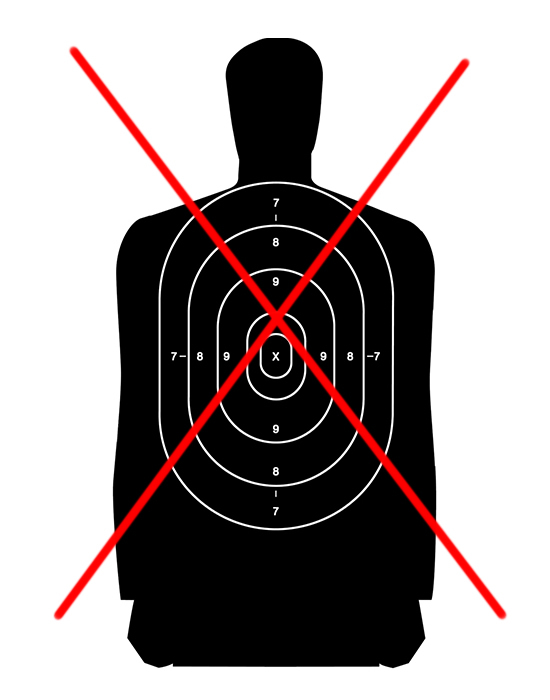 Effective targets on a human attacker are few and they are small. Get training that focuses on effective target areas and practice for good hits on these effective, small target areas exclusively. If you’re going to defend your life or someone else’s life, know what you’re doing and acquire the skill and discipline to be effective. I was an XD-S owner for a couple of years with the original model. As I’ve detailed before, I was a big fan of the XD-S 9mm and trained with it regularly, ultimately putting thousands of rounds through it. 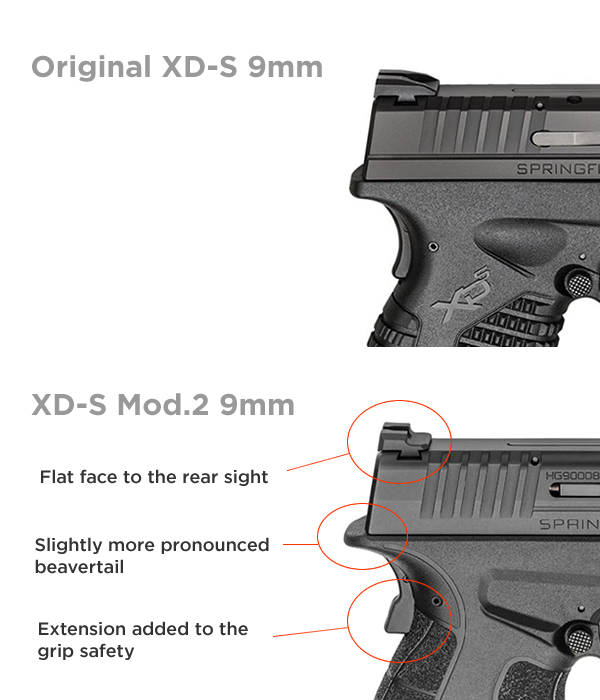 As they’ve done with other XD models, Springfield Armory has now released an updated version of the XD-S, called the Mod.2. 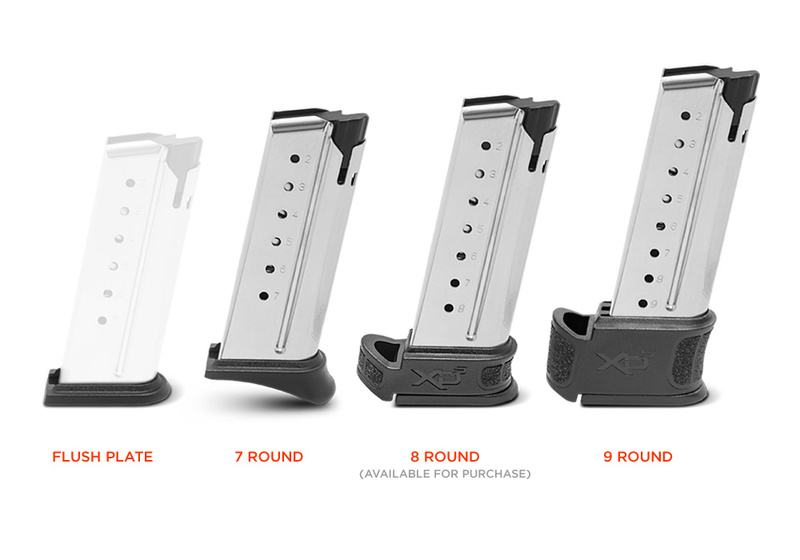 They first released the XD-S Mod.2 in .45 ACP and now have made the 9mm model available. The Springfield XD-S has been a popular model since its arrival. It lives in an increasingly crowded class of EDC pistols, but the XD-S has generally been at or near the front of that class. I recently spent a few days shooting and getting to know the updated Mod.2 9mm version and present my thoughts from that experience here. Hope you enjoy. Why Consider the Springfield XD-S Mod.2 9mm? The XD-S platform has a specific purpose: concealed carry. 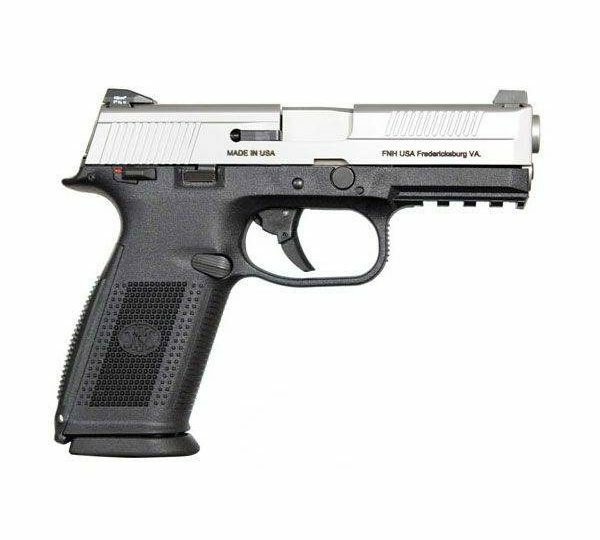 This is a single-stack, subcompact, striker-fired pistol that is both relatively thin and relatively light. It is made for easy concealment with everyday clothes and even with light clothing or formal wear. Like others in its class, the XD-S pistol is a carry gun for when you can’t carry a larger double-stack pistol, or maybe you just want to be less encumbered. Before pulling the trigger, I noticed that the Mod.2’s redesigned frame offers a grip that is much more comfortable and natural feeling than the original model. I’ll talk about specifics in a moment, but suffice it to say that I immediately liked the redesigned grip. But as you can see from the specs above and the photos here, there is very little basic design difference from the original model here. My first shots were not as accurate as I’d have hoped. I spent some time getting the hang of shooting this little pistol, and eventually I did, but it was a bit hard for me to stay consistent, I found. It’s a subcompact pistol so it’s going to be a bit snappier than a compact or full-size model, but it seemed a bit more violent than I remember the XD-S being. I chalk this up to the relatively high bore axis as compared to the Glock 43, which is the only subcompact that I shoot these days. By comparison, the G43 is a softer-shooting gun. Anyway, after 20 or so rounds I had it figured out, but my trouble was mostly from one feature: the trigger. The trigger of the old XD-S was always a bit mushy and the new XD-S Mod.2 has that same mushy trigger. It’s true; this update was a cosmetic update. I confess that my trigger trouble stems mostly from the fact that I shoot so much with one specific trigger (on my carry G19) that different press characteristics throw me off a bit. No biggie, but it’s worth mentioning that the notorious trigger of the XD-S remains. I don’t like it, but others may. After all, the XD-S is a very popular pistol. When I concentrated it was easy to be accurate out to 10 yards on 2” circles so I expect it’d be no problem at 15 or 20 yards to get consequential, incapacitating hits. I shot the pistol using both the pinky-extension magazine and the extended magazine. Both were just fine and I was able to get my whole hand on the grip with the pinky extension. I enjoyed the bright yellow (Tritium loaded) front sight against the blacked-out rear and found it easy to get a good sight picture every time. The new XD-S Mod.2 9mm is available in three different sight configurations: yellow w/Tritium front sight, red fiber-optic front sight, or a fiber optic front sight with a Viridian red laser mounted to the front of the trigger guard. Over a couple of days I shot a couple hundred rounds of Fiocchi 115gr ball ammo and a bit of Federal Premium 124gr HST and it all ran just fine. Springfield has already done an extensive 25,000-rd torture test without a failure (they say) and I have no reason to doubt its reliability (except that the old model did not run Hornady 135gr Critical Duty rounds – I didn’t check this time). Overall, the gun ran fine and was easy to manipulate, load, eject the empty magazine, reload, and lock open. The controls seem well placed. No problems here. As I mentioned, I found the grip to be very comfortable. I like what they’ve done with the contours and the change in textures. The original texture wasn’t grippy at all and the big, chunky “texture” was just knobby. This one, while not really grippy either, is at least comfortable. The comfort remains while shooting the gun, too. Good job. The pistol’s snappiness is to be expected, but I didn’t have trouble controlling it or getting my sights back on target. I was able to easily shoot faster than 1 shot per second without sacrificing any accuracy. There’s really nothing up front on the frame on which to rest your support-hand thumb to help mitigate muzzle flip, but that’s not a grave error for a subcompact. I tried using the takedown lever as a thumb rest, but the recoil made the lever abrade my thumb more than I’d like. Again, no biggie, but that high bore axis has muzzle-flip consequences. The XD-S Mod.2 9mm conceals very easily; it is purpose made to be easily concealable. Even the pinky extension on the 7-round magazine wouldn’t cause much of a concealability issue. But there’s also the flat base plate if you’d like to go that way. At 7 rounds for the flush/pinky mag, the XD-S Mod-2 is pretty competitive for a single stack. The Glock 43 has only a 6-round capacity with the stock magazine and while the G43 is slightly shorter, the XD-S Mod.2 is not a big gun for the extra round. Good stuff. I must say that the inclusion of a 9-round extended magazine is pure idiocy. This is a concealed carry gun purposely made for deeper concealment. An extended magazine serves no logical purpose in that role and Springfield Armory needs to fire someone for that silly move. Subcompact pistols should NEVER have an extended magazine. A 1-round extension (like Taran Tactical makes) is often useful, but a 3-round (or more) extension for a subcompact is just stupid. Ahem. Changes for the Mod.2 include the profile of the rear sight, a slightly extended beavertail configuration, and an extension designed into the grip safety. All of these are positive changes and all of them are mere slight improvements. That’s not a dig, just a fact. It’s all good stuff. The redesigned frame and grip are much more comfortable than the old model. 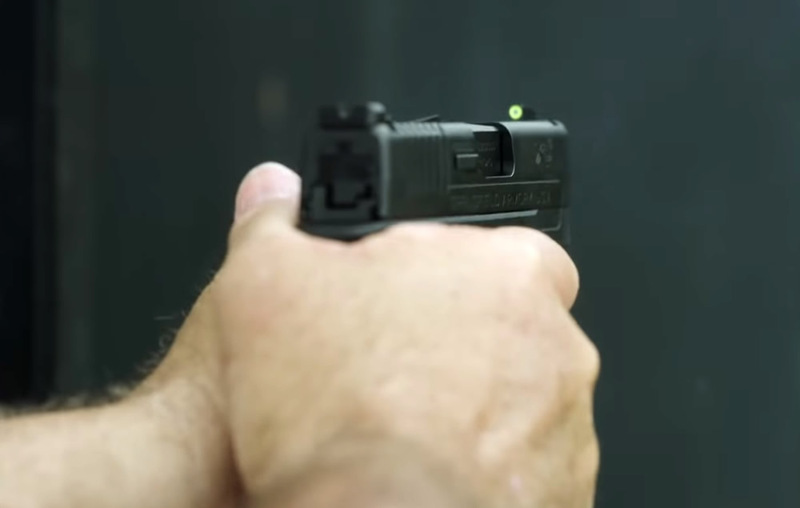 It’s great that the XD-S Mod.2 9mm comes in three different sight/laser configurations. Some folks will like that the rear sight is A) blacked out, and B) has a bit of a flat ledge on the front for easier 1-handed racking of the slide. This pistol conceals easily and has decent capacity. It’s a small thing, but the pinky-extension mag plate is a nice and useful touch. The trigger is not very nice and the relatively high bore axis gives this pistol a bit more muzzle flip than some subcompacts will have. The grip texture looks nice, but is not very grippy. But that’s just about all I can find wrong with this little gun. 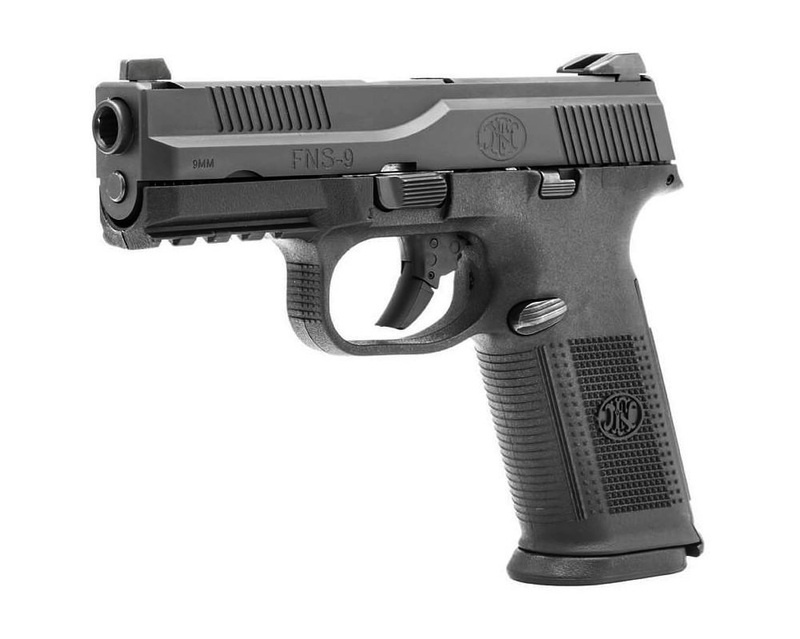 This is a comfortable pistol to hold and to shoot. The update made good progress on this score. The XD-S Mod.2 9mm is plenty shootable and easy to get back on target, but I took one star away for the mildly excessive muzzle flip. The variations in sight configurations can allow you to get the setup that works best for you; another plus. For a shorty subcompact, it’s plenty accurate and the XD-S platform has long been recognized for being accurate. Any misses I made were entirely my fault. There’s precious little available for aftermarket customization, save for a trigger kit (which is really not so good). The sight-config variations are a nice touch, but there’s really nothing that one needs to do to this gun. The Springfield Armory XD-S Mod.2 is arguably one of the best single-stack subcompact pistols on the market. There are some very nice updates in the Mod.2 and I can easily recommend this pistol to you, provided you shoot it first and learn if it fits your hand, your style, and your needs. Rent it and find out. Your Rights Are Infringed. They Are Very, Very Infringed. Even though the Constitution of the United States recognizes and codifies your right to keep and bear arms—without infringement—your state and federal governments declare that you may under no circumstances keep or bear arms unless you and your arms are compliant with many, many infringements upon your God-given rights. And then only if those who manufacture the arms you might purchase can successfully navigate the intricate web of tyrannies upon their activities and operations. Truly, this state of affairs seems strangely tyrannical for The Land of the Free. Disclaimer: The views expressed in this article are that of the author alone, and are not necessarily those of Eagle Gun Range. The United States of America existed as a Constitutional Republic for 143 years—becoming during that time the greatest, freest nation on the face of the planet—without a single federal gun law. Then, in 1934, the federal government began perpetrating an unending series of federal tyrannies upon firearms models and configurations, firearms manufacturers, and the individual liberty of those who keep and bear firearms. It should surprise no one that this tyrannical process of infringements began with legislation written by a Democrat from Connecticut, Attorney General Homer S. Cummings. This Act of Congress—the National Firearms Act (NFA)—was enacted by the Democrat-controlled 73rd Congress. From that point on, the U.S. federal government never looked back. It then proceeded to continually infringe on every individual’s God-given right to keep and bear arms; the only right referenced in our Constitution with the explicit warning that it “shall not be infringed.” In short, our government lacks authority to infringe upon our rights, yet members of state assemblies and U.S. Congress write and pass these infringements, Governors and Presidents sign these infringements into law, and these infringements remain and pile up, illegal law upon illegal law. Fast forward to today where, at the current end of a long train of abuses and usurpations pursuing invariably the same object, the most recent human-liberty kerfuffle surrounds homemade and 3D-printable guns. Even though many Americans have no interest in making their own firearms (something that is now and always has been legal in the United States) or 3D printing firearms, the legal debate surrounding these issues is highly instructive and it exposes some key tyrannies and infringements that Americans may not have been aware of or may have long ignored. A prominent argument against printed guns is that they are perhaps undetectable. And this is important because, according to U.S. Code, the only reason, apparently, that the US government allows citizens to keep and bear firearms today is that years ago someone invented the metal detector. I guess that was a fortunate event? The Undetectable Firearms Act of 1988 was introduced by William J. Hughes (D-NJ) and it easily passed the Democrat-controlled 100th Congress. It was signed into law by everyone’s favorite Republican President, Ronald Reagan. This tyrannical and illegal law infringes on every individual’s right to keep and bear firearms if the model they prefer is not detectable by a walk-through metal detector. So seriously, what if metal detectors were never invented? Would the simple fact that we didn’t have the technology to detect firearms at airport checkpoints be a justifiable reason to completely end the inalienable right to keep and bear arms? Would we really outlaw all guns in an effort to ensure that we kept them off airplanes? Would we be willing to give up the second amendment in its entirety to ensure our safe passage on airplanes? I mean if we can completely secure our airplanes and make sure that these bad guys don’t hijack anymore planes, then we should definitely ban guns, right? We can’t detect them, so what else are we to do! But wait. Even in Bizzaro World a complete and total ban on guns would not stop airplane hijackings. Not having guns on the planes did nothing to stop 9/11. That all went down rather easily without the need for one single firearm… 3D printed or not. So why ban 3D printed guns? It certainly doesn’t solve the problem. Terrorists have proven that they certainly don’t need to sneak some 3D printed gun parts and one lone bullet onto an airplane to hijack it. Why would we let this ridiculously low level of justifiable “need” go forth and set such a dangerous precedent? And if we are not willing to apply it to everything, across the board then why are we so quick to throw 3D printed guns under the bus? Read the whole article: Bizzaro World: What if metal detectors were never invented? So does this ridiculous and illegal precedent for reliance on detecting technology clear the way for tyrannical tech-related mandates? You bet it does. And what if that tech hasn’t even been invented? There is a provable answer to this question, for indeed, they already have created law that requires compliance with a yet-to-be-invented technology—in Commefornia. Tyrants in California have already written a law that requires manufacturers include in their firearms a technology that does not yet exist. Just as stupidly, this ridiculous law has been upheld by the courts. That’s right; the law requires a technology that does not currently exist. For this and other reasons (detailed in the article—please do read the whole thing), it is impossible for anyone to comply with this law. Even so, as is detailed in the article, litigants appealing the law before the Court are prohibited from arguing against the law on grounds that the law is impossible with which to comply. I’m not kidding. What good are rights when with them we have no way to comply with the law? We citizens have the right to keep and bear arms, but arms deemed “safe and legal” may not be manufactured or used in California. Those that are non compliant and allowed (another scary bit of tyranny) to be manufactured must remain on the Roster of Unsafe Handguns. With this mechanism, for reasons that defy logic and morality, the manufacturers can be held liable for any use of these “unsafe” guns…guns that are in no way unsafe. These kinds of requirements are important components of fascism, by the way. Oh, and this law does not apply to any firearms used or purchased by any law enforcement agency. Well played. Yet another example of something that is allowed for government and not allowed for the people; a practice known by a specific term: tyranny. In the District of Columbia v. Heller, 554 U.S. 570 (2008),, the Supreme Court of the United States held that the Second Amendment protects an individual’s right to possess a firearm, “unconnected with service in a militia, for traditionally lawful purposes.” There are many specific details covered in this case and its ruling—one that is mostly viewed as a victory for human rights—but there are some very scary and tyrannical precedents there, too. Firstly, and this is more of an aside, the Second Amendment doesn’t “protect” anything. It is merely a reference to God-given rights possessed by each individual inalienably, whether our Constitution exists or not. It is moral men and armed citizens that protect everything worth protecting. The court’s ruling here invests authority in words on paper where there is none. Ahem. The primary perversion of law in this case is that much of the reasoning referenced in the case for upholding an individual’s right to keep and bear arms was that a handgun is a firearm that is “in common use at the time” (something that emerged in the 1958 United States v. Miller case). I’m compelled to point out that there is no “in common use” clause to the Second Amendment. Rather, it says “the right of the people to keep and bear Arms shall not be infringed.” It does not describe or limit which kinds of Arms nor does it describe under which circumstances these Arms may be kept or borne. It simply states that this right of the people may not be infringed. And yet, the highest court in the land has declared an assumption to which all Americans must adhere: that the wording is, “the right of the people to keep and bear arms that are in common use shall not be infringed.” This is an outright lie and perversion, and court rulings and legislation that assume this lie are pure tyranny. And this is not all, not by a long shot. There are many other state and federal infringements on your rights not detailed here; even though no government has authority to infringe on your rights, and violating your rights is a crime. So, yes, your God-given rights are infringed upon. They are severely infringed upon. The government has invoked a series of infringements since 1934 and there will continue to be more and more unconstitutional, tyrannical laws enacted until…what? That’s the question: how will this long train of abuses and usurpations pursuing invariably the same object be stopped? And when? And by whom? Will Americans be able to successfully appeal to the better natures of our elected representatives to right these wrongs…or will Americans, in that proudest of American traditions, be again forced spill the blood of tyrants in order to secure our liberty? It’s an important and very serious question. It will have to be answered, for liberty is not negotiable.